For many visitors, visiting Cape Sounion in Attica comes as a shock and a relief. Sometimes the first sightseeing destination for the tour group participant who arrives in Athens at midday, the contrast between the hustle and bustle of modern Athens with this serene, imposing edifice is sharp. Sounion, sometimes called just Sounio, is reached by an easy, scenic drive south from Athens along the western coast of the Attica peninsula. If you are not driving yourself, you can also book a coach tour, either ahead or when you are in Athens. Arriving at the Temple of Poseidon, the tour buses emit their passengers and everyone scrambles past the always-busy gift shop and a decent-looking restaurant and up a small hill to where Poseidon still reigns, overlooking the sea. The ruins of another temple to Athena, a mere goddess of wisdom after whom Athens itself is named, are usually neglected or pointed out in an instant as a group treks up to see the main attraction. And attraction he is. Though his famous statue is long gone, safely imprisoned at the National Archeological Museum in Athens, great Poseidon needs no bronze props to make his presence felt. The Greeks have always watched the sea, for the return of loved ones, for the safe delivery of goods, for news of war. Maybe that's why the Temple of Poseidon, with its magnificent view of the Aegean, seems to still fulfill the role of seawatcher from the high promontory. (Or maybe it's just the combined eyepower of several hundred visitors, many local Greeks included, intent on watching the blazingly beautiful sunset). The temple itself is in the plain Doric style and was erected by Pericles, during the Golden Age of Greece, and is said to be on top of the ruins of an earlier sea temple which may date back to Mycenean or even Minoan times. If you are fortunate enough to find yourself among them, also be intent on watching your step on the alternately rough or slippery rocks, and if you are travelling with young ones, people prone to vertigo, or merely the inherently clumsy (like me!) please be aware that there are few guard rails, chains, or anything similar protecting you or your loved ones from a quick plunge into air, water, and rocks. Add to this a strong, frisky breeze - bring jackets even if you've been sweltering in Athens - and, perhaps, the fact that Poseidon also rules over earthquakes, and you have cause for caution. But the cause for celebration wins out. Sounion is cleansing to the mind and spirit and thrilling to the soul and heart. Don't miss it! While there, you'll be at one point of a magical triangle which the ancient Greeks enjoyed - from Sounion, you could see the Temple of Aphaia on the island of Aegina, and the Acropolis itself. If you are traveling independently, Sounion can be easily reached by bus from Athens, or by organized day tours. 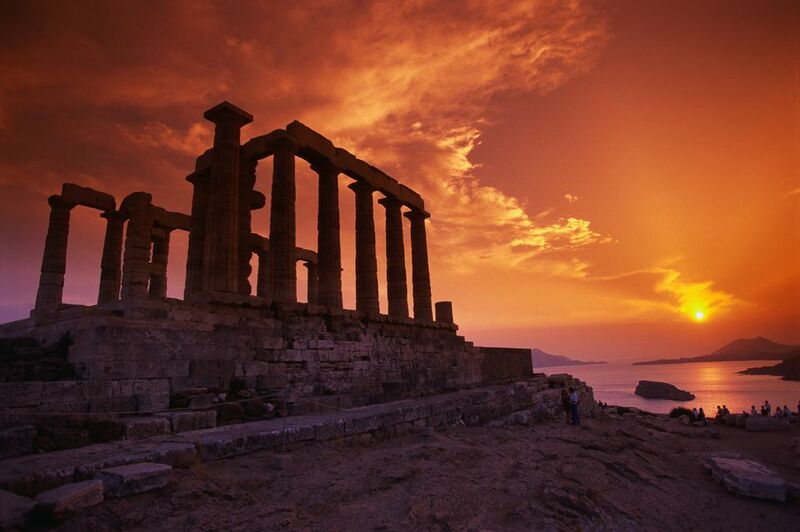 Sunset is the most popular time to visit Sounion, though the tour buses are there almost non-stop. Early morning hours, as with most sites in Greece, will give you the best chance of enjoying Sounion without a crush of visitors. If you've rented a car, it's also an easy and beautiful drive on good roads if you've rented a car. Beneath the promontory of Poseidon, there is a small resort area offering several hotels and anchorage for yachts. If you just can't get enough of the temple itself, you can easily stay within view of it. The Cape Sounio Hotel is one option. How Is the Goddess Hera Connected to the Olympics?